Portable generators are useful when temporary or remote electric power is needed, but they can also be hazardous. The primary hazards to avoid when using a generator are carbon monoxide (CO) poisoning from the toxic engine exhaust, electric shock or electrocution, fire and burns. Every year, people die in incidents related to portable generator use. Most of the incidents associated with portable generators reported to the Consumer Product Safety Commission (CPSC) involve CO poisoning from generators used indoors or in partially enclosed spaces. 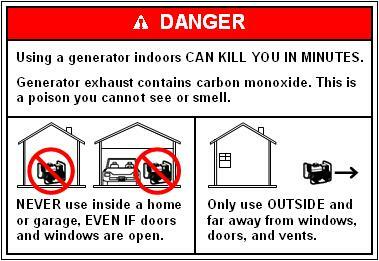 If you start to feel sick, dizzy or weak while using a generator, get to fresh air right away. Do not delay. The CO from generators can rapidly kill you. Follow the instructions that come with your generator. Locate the unit outdoors and far from windows, doors and vents that could allow CO to come indoors. Install battery-operated CO alarms or plug-in CO alarms with battery back-up in your home, according to the manufacturer’s instruction. CO alarms should be certified to the requirements of the latest safety standards. Test batteries monthly.